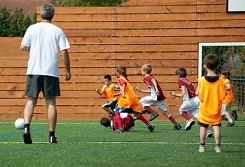 “30 Blogs with the Best Tips for Coaching Your Kid’s Under Six Soccer Team” was shared with our Sports Techie community blog by Carrie Dotson at summernannyjobs.com. Sports Techie, Our next door neighbor as kids was Bobby Howe, a former West Ham professional football player and a past U.S. Soccer, Director of Coaching Development. He was an assistant coach with the Seattle Sounders of the old NASL in that pro sports era. I was older than 6 at that time but my youngest brother was right in that age group. Because of this relationship, our family had soccer role models growing up much like today’s American youth does because of the success of Major League Soccer. Boys and girls as young as 4 or 5 are watching games on TV and with mobile devices such as smartphones and tablets and see firsthand how MLS, Premier League and Champions League players all carry themselves on and off the pitch. They also notice at this impressionable age whether each player is having fun playing the grand old sport of soccer as they did as lads or young girls because that is the number one reason any kid under six plays organized sports, for the fun of it. What you may not realize is the Sounders FC record breaking MLS attendance this year at Century Link Stadium was not without precedence. When your neighbor is coaching the former Sounders in a game on April 9th, 1976, against the New York Cosmos featuring Pele, Giorgio Chinaglia and Franz Beckenbauer, in front of 58, 128 fans at the first ever game in the new Kingdome, you are in love with soccer for life. Seattle lost the Soccer Bowl of 1977 but averaged 24, 226 fans per match. This match is absent from the Sounders FC website. The Sounders FC organization broke another Seattle viewing record with 67,385 fans for one game in 2103. They also set the MLS attendance record for the fifth season in row at 44,038 per home game. Other MLS teams had over 20,000 plus fans a game in nearby Portland, Vancouver, Los Angeles, and Montreal, Canada. MLS legend and former International and Team England superstar Dave Beckham just announced his addition to a new Miami franchise opportunity bid. Under six-year old kids in North America have never had this kind of exposure the game and players to emulate like #FlipHenry of the N.Y. Red Bulls. I hope these 30 wonderful bloggers can help you with any and all soccer coaching needs for your kids. My Father was an all-around sports concessioner with a passion for coaching basketball, he liked soccer and was our biggest fan but his coaching knowledge I would rate a B. 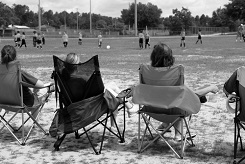 Our Soccer Mom grew up in Ecuador and loves the game but also was not the greatest soccer resource. Now Bobby Howe, he rated an A, but not everyone has this kind of next door resource growing up which is why I started Sports Techie. Sports Techie please file these six coaching your kid topics away in your database of a brain or as a browser favorite in case you need the coach support or if some or all become an issue. A few of my past soccer coaches at the Boys and Girls Clubs, YMCA and Parks & Rec could have used these links, as could some of the parents, especially the sideline behavior 101 info. I was on the cusp of the introduction of select programs that are a social norm in the United States today. This will be an issue that as new parents we will face in just a few years’ time. I will address select teams and kids in a future blog. One high-tech product to consider for this age group is a techie head band created to protect a child’s soft head. I appreciate your parental, coaching and friendly feedback as a blog comment or via any of our social media network links below.